As this is written on April 25, 2015, we are two days away from the 4th anniversary of that Super Outbreak of tornadoes in 2011. This whole four-part series is intended as a look back on those events, and the good things that came out of them. That said, during the course of the first three blogs, I either forgot or completely omitted some things that need to be included, so that assortment of stuff starts here. During the What Stands in a Storm book report in blog one, I noted briefly that it was interesting reading the stories of everyone in the book about how they reacted to the impending storms. There are many ongoing studies from a social sciences standpoint on that very thing. Where do people go? What do they do or bring with them? How will they know if they’re safe from the storms and get the all-clear? Shortly after my return from Alabama in 2011, someone where I work confirmed what I’d heard at the NWA meeting. Some of the Spanish-speaking people that are in our country didn’t know what to do! Many of them did the only thing they could think of, and they stood in their doorways. That’s a good thing to do in an earthquake, which they’re probably more used to, but an awful idea if tornadoes are possible! So with just that one story, we know we need to have a way to better communicate with people who don’t speak English well, and to let them know where to be when storms hit…so they’ll know before that happens. Just that one story created at least two things we need to work on! There were so many other thing just like that we learned, and it’s all fascinating to me, even when people do what they’re supposed to do! Later on, I talked about the impact the storms had on my friend James Spann, and I didn’t mention that I was the same way. I’m sure his feelings were way more intense than mine, but still, losing 14 people to tornadoes on my watch was terrible for me, and I felt terrible about it. So I know to an extent how he felt. Eventually I learned that there is just so much you can do about stuff like that. In the aftermath, one thing to do is simply to correct things. Just how Spann’s data provider fixed their problems, I fixed a lot of mine. I have a laptop with radar on it that I can carry around to different studios, a lot of the station’s power issues are not issues now, and I’ve changed the data provider I use for radar information. That was vital for me in the early months after the storms to make my coverage better, and that’s something I learned from none other than James Spann himself. So while neither of us will ever forget that day, and the loss of life will always hurt, things are better for future coverage both here and in Alabama as well. I have to bring up one thing I mentioned, that Ashley Brand isn’t at Spann’s station anymore. I have no idea whose fault that is, but if someone decided she wasn’t good enough to be on television anymore, that’s flat wrong, and a crying shame. I’ll never forget Ashley sitting in a Dollar General store parking lot early in 2011. She was watching a storm that was clearly rotating, talking on the air to James Spann and Jason Simpson, and telling people she saw in the parking lot to get indoors to safety. That was world class by her. From all I saw of her on television, she was a fantastic member of that team, and should’ve never left! She’s doing well now, and is still covering weather, which is a good thing! Lastly, that phrase Ashley Harrison used to write on Christmas cards…”I love you as big as the sky!” The second time I read about that in the book, it occurred to me the horrible irony (if that’s the right word) of that. Her favorite phrase to write on cards to family was about the sky…and it was something from said sky that plucked her from her boyfriend’s arms and cut her life short. Every time I think of that, it’s quite stunning for me. Whenever I think about it, I’ll gaze randomly into the distance and play with the wristband on my left arm. Even though that thought has occurred to me many times since I read the book, it still renders me speechless. Even now, I just stopped for a full minute or more, with my arms folded up just thinking about that, just another one of the hundreds of deep thoughts that come from that whole event that cannot be explained correctly with words…or at least with the word set I have in my mind. I can’t imagine how her parents processed that, if they ever have, for that matter. I can only imagine how the hundreds of relatives of those lost have similar things of their loved ones to remember that could be incredibly painful. That’s why it’s always important to pray for survivors of things like that. I hope you’ve enjoyed this series. The whole thing has helped me to process my reactions to the storms, the loss of life here, those who have helped me through that process, and it’s helped me to move on. Closure is an amazing thing, even when it takes four years to get there! On March 24, Sullivan South played Gate City in baseball. I called that game for Top Gun Radio, and it was a 12-2 win for the Rebels at home. The game ended in five innings, so I was able to get home a bit early. It had been a few days since I had ordered my items from the Ashley Harrison Scholarship Fund, and I was hoping the package would be there when I arrived at home. Upon arriving home, I found that the package was delivered! I was excited. This whole thing represented a bit of closure for me because of the severe weather that day that cost Ashley and a couple hundred others their lives, fourteen of them here. As has been said multiple times on this blog, I was heartbroken by the loss of life, and it was months before I could talk about April 27, 2011. That explains my excitement, and I took the package and went to look at its contents. The bracelets and the koozies are pretty much self-explanatory, and look just like the pictures I posted in the previous blog. The first bracelet I took out of the zip-top bag and put on my left arm, which you can see on the left. It’s been there ever since. The second one and one of the koozies I reserved for my nephew Jacob. He’s a big Alabama fan, and I knew he’d appreciate one of each of those things. The third bracelet went to my office, and the 4th one doesn’t have a home just yet. I’ve considered giving it to either James Spann (who may have one already) or perhaps one of the two fellow meteorologists who helped me get through that day emotionally. As mentioned earlier, I’d heard Ashley’s story, and when I drove my car on its first big trip, I decided to name it Ashley since it went to Alabama first. So the last of the 5 bracelets I have is now hanging from the rearview mirror of my car. Over the course of the last two or three years, I’ve tried to make a decal or something to put on the car to honor the victims of the tornadoes that day, and I finally found it when I put that bracelet on the mirror the next day. It felt wonderful to finally get that thing accomplished! As for the koozies, two of them are in my office. My nephew has that third one, and I still have two in the package trying to figure out what to do with them. It was my goal with all of these to have a remembrance of that day everywhere with me, and that’s been done here. But at the end of the day, that’s not the best thing. As I was looking through the 10 items in the package, I noticed the invoice, which is typically packed in with the items when you buy things online. When I picked it up, I noticed that this was a bit heavier than your regular folded in half sheet of paper. 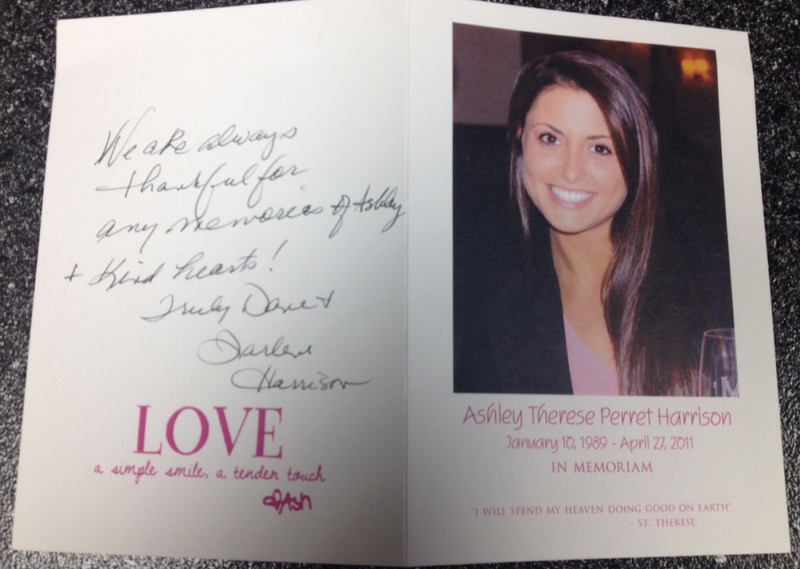 Indeed, there was a card there with Ashley’s picture on it! I wanted to look at that first, but the invoice was half-open and had what appeared to be hand writing on it. When I saw the scribbles, which you can see on the card, I knew. This wasn’t some ultra cool computerized printout, that’s actually their handwriting on the card and the invoice. Amazing! I was rendered speechless, and I’ll be honest that there were even a few happy tears that I had to wipe away. Even now, it’s hard for me to describe the feeling. In a way, having this little connection to the Alabama part of that outbreak and those that were lost is part of it, but this whole thing represents those who were lost here in our area, Camp Creek and in Glade Spring. I’ve never met those folks either, but as long as I live I’ll never forget them. So in a way, this represents a bit of closure, too. I have a way to represent Ashley and those who were lost, with the bracelets on my arm and on my car, too. Thankfully, the one on my arm actually fits! All of the previous two blogs and all these 3000+ words…that’s the thing. Regardless of me wanting to signify anything on my left wrist or my car or anything else I’ve done with that $42 donation to an Alabama scholarship, Ashley’s parents are amazing. 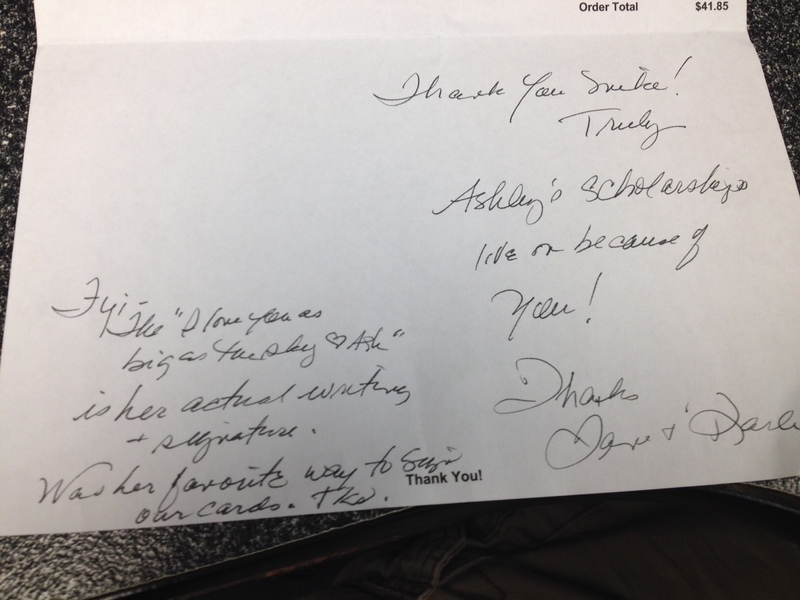 It’s been nearly four years since everything happened, and yet here they are still hand writing notes to people who bought stuff to donate to their daughter’s scholarships. Honestly, they could’ve stopped that eons ago, and nobody would’ve blamed them a bit. Especially when you consider something I have no way to imagine, that they’ve lost a child, and in the most sudden way possible. Flashing back to the book What Stands in a Storm, you get a vivid picture of what that is like. Parents of some of the folks who were lost in that terrible storm in Tuscaloosa told their stories of what they felt like in the days after the tragedy. Many of them have their own scholarship funds at Alabama as well. I think about them quite a bit ever since I read that book, and I pray for them. Even now it must be hard to think about that. If it took me months and I never knew anyone involved, I can imagine having a loved one suddenly taken away by weather. It is amazing that they were able to share their thoughts with Kim Cross in her book. I have a few loose ends to tie up, and that will be the final blog in the series. As it always is with something like this, I tend to forget some things along the way, and remember them when I get farther along in the series. That will wrap the whole thing up, and I’ll post that one next Sunday, on April 26th, one day before the 4th anniversary of that awful day. Click here for part four! FYI: Spoilers to the book What Stands in a Storm begin here. I will do my best not to give away the entire story, but you might want to give the book a read before proceeding. Inside the book What Stands in a Storm, Kim Cross tells the stories of people in the path of the terrible tornadoes on April 27, 2011, in Mississippi and Alabama. College students at the University of Alabama are a big focus, since one of the tornadoes hit Tuscaloosa that awful day. Cross tells of three students and intertwines their daily lives into that terrible day, telling how each of those people tried their best to stop everything just to keep themselves safe. Their story, along with that of Carson Tinker and Ashley Harrison, have one common denominator. The five were all watching James Spann. I’ve talked about him a hundred times before on this blog in various circumstances, but he is an institution when severe weather is happening in Alabama. There’s even a Twitter parody, @StuffSpannSays that will parrot a lot of the things James says or tweets during newscasts or severe weather in Alabama. Through the years his staff has changed, as Ashley Brand has since been replaced (unfortunately!!!) and Jason Simpson is himself a chief meteorologist, now in Huntsville at WHNT. James is the constant, and the way he presents himself typically tells people what to expect when weather isn’t going to be good. If you see suspenders, that’s one thing. If he’s rolling up his sleeves, that’s really bad news. In Carson’s book, A Season to Remember, he tells his story from that day. A few bits and pieces of that are in the Kim Cross book as well. He talks about watching James Spann cover the storms on television. That has had a profound impact on James because there were errors in the placement of the radar images that day. James has explained a few times that the software package that the TV station purchased displaced the radar image by quite a wide margin, and that caused James to pinpoint places that weren’t in the storm, and miss those that were. Always one to focus on how he could’ve done it better instead of complain about what the hand he was dealt that day, James has said since the book came out that he feels responsible for the fact that Ashley died. He knows now that they were watching him, and that he was giving wrong information at the time, before the storm was seen on their Tuscaloosa skycam. In an effort to change that, the software vendor has fixed their problem, but also James has put into place a second source for radar data during severe weather coverage…just in case. To be clear, there’s no way James Spann should feel responsible for Ashley losing her life in those storms. Even if he’d known their apartment and that the tornado was going to hit it, they were in a safe place anyway. And that is one of the few storms where being in a safe place simply may not matter. Yes, Carson and his roommate survived, and Ashley was the only one lost when the three were in the same place when the tornado hit. Sure, the storm picked up all three of them and threw them, but the only way fixing the location of the radar on the map would’ve helped is if the three of them had heard that the storm was going to hit their apartment. Even then, the only good thing to do is leave the apartment to get out of the storm’s path, and that could’ve killed all three of them. Clearly, with that storm at that time, there was no winning…not just for Ashley but for so many other people in Alabama and all sorts of other places nearly four years ago. When I was finished reading the book, I took to the Internet to find out about the scholarship funds set up for those lost in the tornado. There are a couple amazing people in that book who have scholarships in their name at Alabama, and I was thinking about contributing to one of them. As a matter of fact, information on those scholarships is included on one of the back pages in What Stands in a Storm. I was looking with intent for some sort of memento of the thing. In 2011, the car I owned at the time was damaged by golf-ball sized hail while I was covering the storms here in late April. So I bought another car later that year, and the first big trip I took with it was to Alabama. On the six hour trip back from Birmingham, I thought a lot about a lot of things. I’d just found out about Ashley during the meeting, and I had a few friends named Ashley, so I decided that’s what I’d name my car. Over the course of the next few years, I wanted to get something on my car having something to do with that. I almost had decals made a couple times, but nothing really looked or felt right about it. Eventually, I thought of Ashley again here in 2015, and I found the Facebook page for her scholarship. I hit the Like button nearly immediately. On her site, there’s a picture on the top from an event where there were t-shirts made. I thought that was interesting, so I looked farther down the site and found a link to www.2ndhandbooks.com. 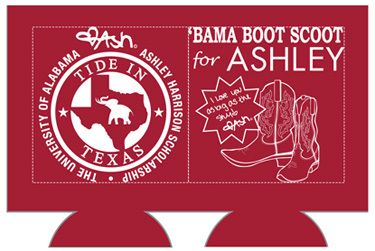 On that site, when you search Ashley’s name, you get a list of things you can buy to support her scholarship fund; there are t-shirts, bracelets, koozies, and pink nail polish. I browsed through it all, and found the shirts from an event for the scholarship fund by Alabama fans in Texas to all be too small. I knew I wanted koozies. Then I saw the absolutely perfect thing, pictured above. I’m not generally a fan of the silicone wristbands (think the yellow Livestrong ones) because they generally don’t fit me well. I guess I’ve just always had big wrists. But these I just had to have, and I bought five of them. In What Stands in a Storm, the story is told about how Ashley would always write that or say the phrase on that bracelet, “I love you as big as the sky!” to her family, and sign it just the way it is on that picture. In fact, the writing on the wristband is actually her writing, taken from a card she’d written on before she passed away. The koozies (see left) had that phrase and her signature on it too, and they were from a “boot scoot” event in 2012 somewhere in Dallas to raise money for the scholarship. They are crimson colored, with a cool elephant logo inside a Texas outline on one side, and a pair of boots on the other. I picked up some of those as well, just because I wanted to. The whole process wasn’t anything odd, an order totaling a little over $41. I was excited, though, knowing that finally I’d found something to commemorate the naming of my car and that awful event that changed my life a few years ago while changing others’ lives in a much more intense way. Now, all I had to do was wait for the package. I don’t want to sound like click-bait from Facebook, but what came in that package with the koozies and bracelets rendered me speechless, and made me thankful I donated to an Alabama scholarship fund. This whole thing has always transcended sports rivalries, despite my love of all things orange. All of that, my friends, is ready to go here! If you’ve read this blog before, you’re aware of the importance of April 27 and 28, 2011. It was a day that I’ll certainly never forget because of the 14 lives that were lost here in tornadoes that night and early morning. You can read more on that here. This blog is the start of a sequel to that, a four part series that I’ll produce either on Saturdays or Sundays during the month of April. Much of that story starts in the state of Alabama, as I have friends who are way more than colleagues there who were involved in the same battle: Try to keep the people safe from these horrible storms. While it’s impossible to measure success or levels thereof with such things (unless no one dies), it’s clear that the storms were so bad down there that many, many more people should have perished that day. The work of meteorologists all over creation during that outbreak should honestly be rewarded in the highest way possible in this country. That’s not tooting my own horn, either. I’m part of a community of absolutely amazing individuals who sacrifice themselves every time there is even the smallest chance of severe weather to keep others safe from whatever is happening. I’m honored to be a very, very small part of that. Last month, a book came out that caught my eye. I had no idea in the world that such a thing was in the works, but it looked interesting to me. I did remember an article that I’d read from Southern Living magazine a while back, that traced the stories of a few folks through that awful day. The book, “What Stands in a Storm” is an extension of that. Kim Cross, a journalist from Tuscaloosa whose work is seen in all sorts of magazines and newspapers all over creation, wrote both the article I read and the book. And both are simply superb. This book represents a first for me. There are people in this book, who are still alive, that I know. The first one of those mentioned is James Spann, the Chief Meteorologist at ABC 33/40 in Birmingham. I’ve known James through online means for many years and was able to meet him at the National Weather Association meeting in Birmingham in 2011, and later for a weather/life advice meeting during a vacation week the next year. Look under the Weather Info tab for those stories. James and I think along the same wavelength on a lot of things, so it was good to see his story in the book. A lot of it he’s told on his online show Weatherbrains with the passage of time, but some of his story in the book wasn’t as well known. Intertwined with his story is that of Jason Simpson. At the time, he was the morning meteorologist at 33/40, and Spann’s right hand man during severe weather coverage. That in itself is hard to do, because Jason’s was the early show: In the studio at 2 or 3, work through noon. So if there’s an outbreak that goes into the evening, life—mainly sleeping–can be quite difficult. In Jason’s case, the whole day started with an early morning severe weather event that nobody really saw coming. With the big event yet to come, the first round knocked out power to a quarter of a million people in Alabama. That brought Jason to say to one of his producers that mass casualties would happen if these storms hit big cities. A chilling statement to be sure. At separate times that day, both Jason and James would have to deal with awful weather headed toward their hometowns. The other person I know from the book is Brian Peters. He is a retired WCM from the Birmingham National Weather Service office and one of the storm chasers for the same TV station where James Spann works. Brian is also on the Weatherbrains show, and was the man over the audio, video, and presentations at that meeting in 2011. Brian was chasing the storms on April 27 in Alabama, one of a great many who were out following these things, trying to provide James and Jason with videos of storms and tornadoes that were out there that day. At times there were multiple extremely dangerous tornadoes on the ground at the same time, and Brian, along with the other chasers did a good job keeping themselves safe while getting these awful storms on video so people could see what was going on and act appropriately. Their experiences are just part of the book. Kim Cross detailed the stories of folks who tried to keep themselves and/or others safe from these storms, by doing what they’re supposed to do at times like that. It’s interesting to read those, because she includes the phone conversations and texts and person-to-person conversations between the main characters and each other, their parents, and random people in the community who were their friends, neighbors, or clients. These people weren’t only located in Tuscaloosa, but places like Smithville, Mississippi, Cordova, Alabama, and many places in the bullseye of where the worst storms hit. Without giving away too many things, since I highly recommend the book and I think you should go get it and read it, I’ll leave off this report by telling you that if you don’t have tissues nearby, you should. This book contains very powerful moments in the lives of all these people that reduced me to tears many times. It also forced me to a little action, which is the reason why this is the start of a series not only about the book, but that is basically a sequel series to my April 27, 2011, blog (see link above) from a few months after the storms tore through the country. Lastly, “What Stands in a Storm” includes a little bit of the story of Carson Tinker, an Alabama football player at the time, and his girlfriend, Ashley Harrison. I’ve heard a lot of their story, and all of it is involved in a book he wrote (which I haven’t gotten hold of yet), but when I was finished with Kim’s book, I went to look up the memorial scholarship set up in Ashley’s name. That, and my experiences thereafter, comprise the other three parts to this series. The next three parts of this blog WILL contain spoilers to the book, which started the whole thing, so keep that in mind! As for What Stands in a Storm, check out Kim’s website, where you’ll find more information and a behind-the-scenes about her book. Also, I’ve included here the Weatherbrains episode that she was on as well. Her segment is toward the beginning of the show (after all the intros…which takes a while on that show sometimes!). Click here for Part Two! Nick Walker aka The Weather Dude! Weather for the UNC Charlotte area. Photo/Videography, Storm Chasing logs, and my life wrapped in one small blog.